Note the bright yellow eye, barred chest and wing bars, and strong bill. 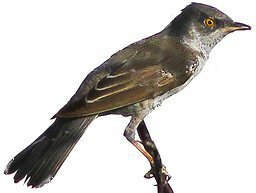 This is a male in summer plumage; vagrants to the UK tend to lack the strong bars on chest and have a much duller monotone appearance as do the males in winter. Unlike the male bird this female Barred Warbler lacks the bright yellow eye and barring on underside. In common with the male you can see the wing bars, the white corners of the tail and the thick bill. A female can have some barring on her flanks but not across the full width of the breast. The juvenile bird is much like the female, note dull eye and wing bars, however the young bird is much browner than the female and never has any barring on the underside. A rare passage migrant to the UK with an average of 150 sightings per year. Breeds in Eastern Europe and Italy where it is considered more common. The birds preferred habitat is bushes and woodland, also known to be attracted to built up areas with parks and bushy gardens. 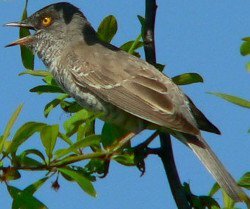 The Barred Warbler is one of the larger warblers, the male easy to identify with his bright yellow eye and barred chest. The female and juvenile birds present more of a challenge but size, wing bars and bill are key identification points. 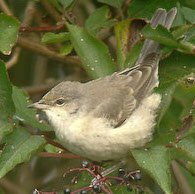 Like other warblers the Barred Warbler is a skulking bird, hard to see, however it's size makes it a somewhat clumsy warbler and it is often heard crashing through bushes.